Proprietary Name: Premier Value Multi Symptom Antacid Berry Flavor What is the Proprietary Name? Non-Proprietary Name: Calcium Carbonate ,magnesium Hydroxide,simethicone What is the Non-Proprietary Name? 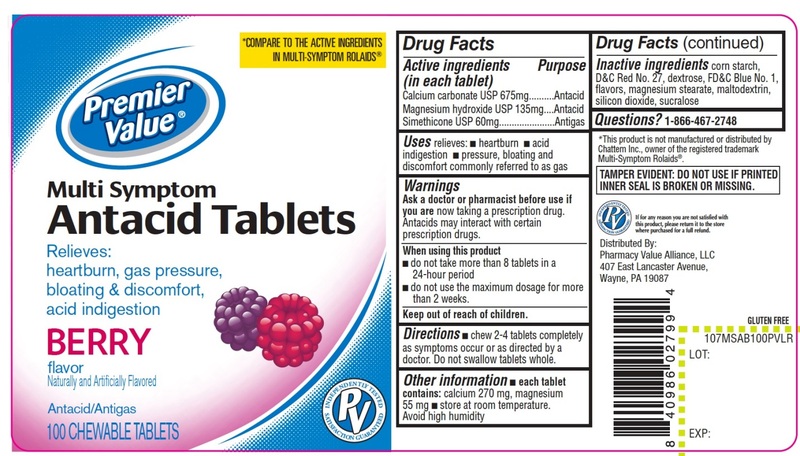 Premier Value Multi Symptom Antacid Berry Flavor with NDC 68016-679 is a a human over the counter drug product labeled by Pharmacy Value Alliance Llc. The generic name of Premier Value Multi Symptom Antacid Berry Flavor is calcium carbonate ,magnesium hydroxide,simethicone. The product's dosage form is tablet, chewable and is administered via oral form. •chew 2 to 4 tablets as symptoms occur or as directed by a doctor. •each tablet contains: calcium 270 mg, magnesium 55 mg •store at room temperature •Avoid high humidity. Corn starch, D&C Red No. 27, dextrose, FD&C Blue No. 1, flavor, magnesium stearate, maltodextrin, silicon dioxide, sucralose.